This is a protein i was excited to give a real shot. Having seen it in the magazines and looking to try something new I grabbed a few Tubs while at the Arnold Classic Expo. The claims made on this one are pretty standard: Pharmaceutical Grade, Highest quality ,better digestion, absorption etc etc. The interesting addition of CLA to the formula is intriguing. Considering not everyone supplements CLA but we all worry about mid section fat. While at the arnold classic I talked for hours with many of the Magnum Nutraceuticals athletes (Holly Barker,Markus Kaulius, Bert Neibergall, Meghan Amelia and many others) . They were happy as can be to make suggestions and offer advice. Being that the company is a Canadian company, they regulate supplements differently. Meaning what they say is pretty much what you get which ,when dealing with supplementation, is important. Needless to say i was impressed not only with the protein but the company as well. I have had it for breakfast, post workout ( added it to my post workout shakeology), mixed in pudding and last thing at night instead of a casein protein. I have had no stomach issues at all. Noticeable increase in muscle density and size. Marked reduction is belly fat and that is always a good thing. How does it mix? you can shake it, blend it even stir it with a spoon and it will mix up nice and smooth no clumps at all. Carefully not to over blend in a magic bullet as it will start to whip if you use a coconut milk. How does it taste? I have had all three flavors. I can say they are near cheat meal worth in the flavor department. The chocolate is milk chocolaty, The strawberry is like nestle quick and the vanilla taste like vanilla bean ice cream. you really can’t go wrong with any of them. 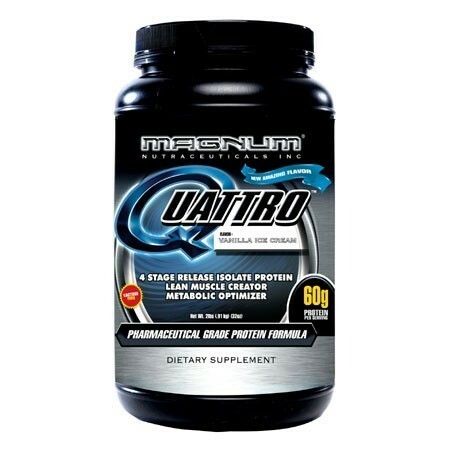 Hope you found this review of Magnum Nutraceuticals Quattro helpful. If you did please share or comment below!